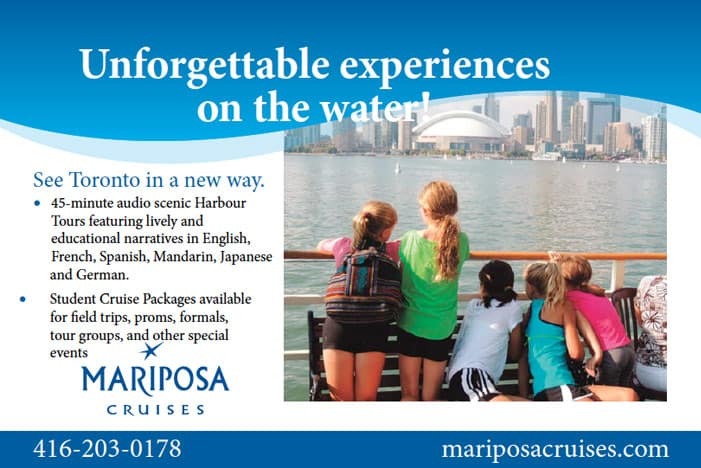 Students can enjoy a unique experience of Toronto aboard Mariposa Cruises’ 45-minute audio guided scenic harbour tours, with stunning views of Toronto’s skyline, harbour and islands. Offered in English, French, Spanish, Mandarin, Japanese and German, the audio narrations provide an interactive experience, and touch on topics ranging from Toronto’s history, neighborhoods, life on the Island, recreational activities, nature, culture and much more. Harbour Tours are offered daily from May to September, with hourly departures between 12pm and 4pm, and are also available pre & post season for group reservations. Student Packages are also available for proms, formals and other private events.